Tomorrow’s new data on jobs: How good would be good? Tomorrow is the day that the Bureau of Labor Statistics releases new data on how many Americans are on the job, searching for a job, or have given up. As usual, the business press is anxious about what the data will say. This month, they want to know whether there will be more indications that the economy is “strong enough” for the Federal Reserve to (eventually) make good on its promise to scale back the extraordinary measures they have taken to nudge the economy towards recovery. On June 19, Ben Bernanke, the Chairman of the Federal Reserve, remarked to reporters that the Fed may trim back its $85 billion-a-month bond buying program in mid-2014 if the economy continues to improve. Is tomorrow’s data likely to show indications of such robustness? Let’s hope we see robust job growth, but even if we do, serious challenges remain and the employment trends don’t provide me with a great deal of optimism that households are feeling anything close to recovered. While the unemployment rate has steadily declined since late 2009, from a peak of 10% down to 7.6% last month, the share of the US population that actually has a job has barely increased at all. The share of people with the job has oscillated within a small band since September 2009, ranging from 58.2% and 58.7%. This is nowhere near the height in 2006 and 2007 of over 63% of the population having a job, let alone the more than 64% employed in 2000. Consumers make up about 70% of all spending in the US economy and most households get the bulk of their income from their paychecks. Until we see the employment rate rise, there’s no way that households can significantly increase their spending. The only ways around this would be (a) if wages increased sharply, which hasn’t happened and isn’t likely to happen (unless we see prices fall, which would lead to other problems); (b) families upped their debt, which many cannot do. And, if we learned anything from the past decade, let’s hope we’ve learned that a debt-fueled economy isn’t sustainable (and crashes rather unpleasantly). 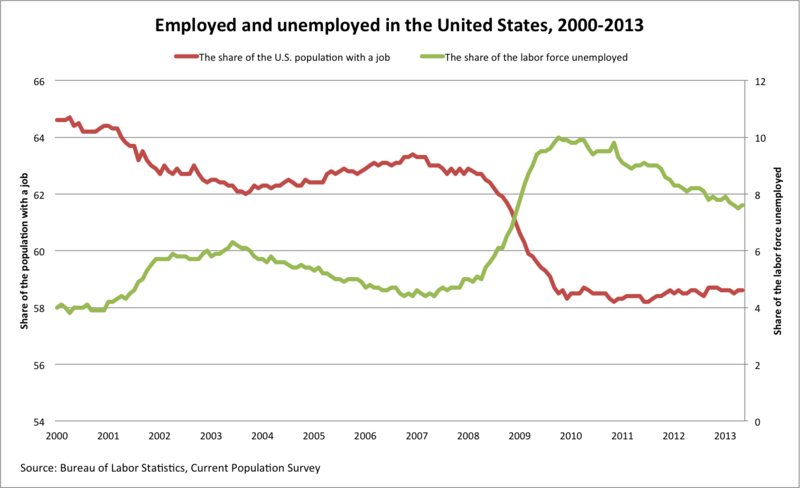 With the same share of the population on the job today as back in 2009, it’s hard to believe that our work pushing the economy towards full employment is anywhere close to done.